RESERVATIONS are NOT needed or accepted. Dining is VERY informal and it is strictly "first come first served". A steaming bowlful of light clear broth-based chowder, acclaimed the best of its kind. Thick, rich, creamy bisque with the delicious essence of fresh lobster. Served with your choice of balsamic, light white zinfandel, blue cheese or our house dressing. Iceberg wedge with bacon, gorgonzola, tomatoes and blue cheese dressing. Your choice hot or cold. Fresh uncooked vegetables complemented with fresh fruit and fine cheese. Served with crackers and Abbott's own special dipping sauce. Created as a light meal in itself or as an appetizer - while your lobster steams. With butter or grilled with herb cheese. Icy cold shrimp in the shell with cocktail sauce and lemon. We blend the filling with bites of fresh lobster meat. Deep ocean quahog shells stuffed with a mixture of finely minced clams and herbs in a bread base. Served with cocktail sauce. Fresh, lump crabmeat with just the right amount of breading and seasonings - sauteed and served with our own special dipping sauce. A heaping bowlful of our succulent, fresh steamers, drawn butter and broth. Not a crunch in the bunch. A bountiful bowlful fresh from the deepwater beds of the North Atlantic. Served with drawn butter and broth. Steamed mussels in a garlic wine sauce. Fresh whole steamed artichoke with a garlic butter sauce. Great for sharing. 12 shrimp steamed with old bay seasoning. 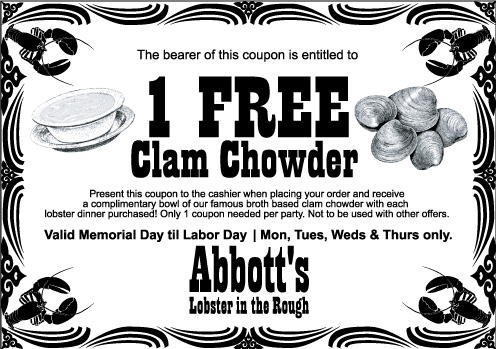 Begin with Clam Chowder and Shrimp in the Rough followed by a heaping bowl of Steamers and Mussels, topped off with an Abbott's Steamed Lobster. All accompanied by potato chips, coleslaw and drawn butter. A feast you'll not soon forget. It's our "best buy". Purity tested from certified growing beds. Served icy cold with cocktail sauce and lemon wedge. Supply changes daily, call for today's offerings. Freshly shucked and served with lemon wedge, cocktail sauce and oyster crackers. A quarter pound of pure lobster meat (more than is found in a small lobster) with melted creamery butter, mounded on a toasted bun. Our Hot Lobster Roll has repeatedly earned Connecticut Magazines "The Best of Connecticut" award! Pure, succulent lobster meat in a toasted bun. Almost twice the size of our classic. Lots of lobster! The latest addition to our lobster roll family. One full pound of fresh lobster meat warmed on a giant freshly baked bun. With all the butter you need. Lobster meat with a touch of celery and our house dressing, overflowing on a toasted roll. A quarter pound of pure crab meat with melted butter on a toasted roll. Tuna and a touch of celery in our own special salad dressing on a toasted roll. Add: clams, mussels, shrimp or lobster. Served with bread. Served with cole slaw and chips. Served with corn on the cob and chips, 1/2 or full rack. Jumbo chocolate chip cookies with your choice of ice cream flavor in between. What's better than a classic New England dessert in the shape of an ice cream sundae. With or without ice cream and some raspberry drizzle. Salted Caramel, traditional cracker jacks and vanilla ice cream. You pick the flavor. We will turn it into a milkshake! Too hot but love the taste - we froze it for you into a refreshing thick drink complete with whipped cream and marshmallows! A big chocolate brownie topped with your favorite ice cream and hot fudge. Assorted Gifford's small batch ice creams and all sorts of toppings. Cheesecake, carrot cake, apple crisp and biscuit strawberry shortcake. 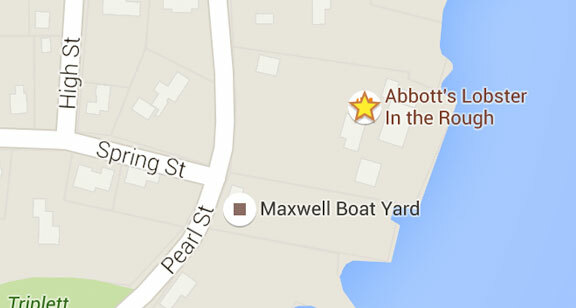 Abbott's has its own dock, that borders the channel along the Mystic River. 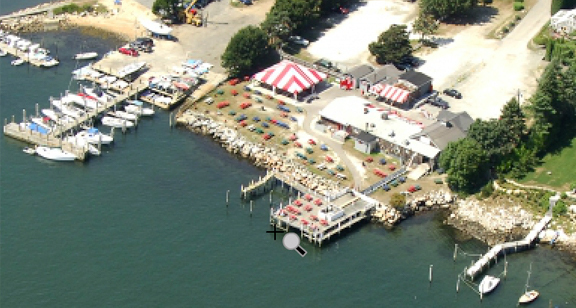 Click the image above to link to Marinas.com's maps & charts.